Are you a soft Drink Addict? They wanted to talk about the side effects of soft drinks, even the diet ones, why are they addictive, and do they really cause cancer? And I have noticed that a lot of young people especially at universities are addictive to these kind of drinks. Unfortunately they do substitute water for this. Here are all the facts!! 1- Soft drinks are one of the main reasons for obesity. The weight gain is directly related to the amount of calories the person takes in. With every single can, people add many extra calories to their body weight, specially from sugar, and extra sugar is direclt converted to body fat. 2- Soft drinks can cause diabetes. With every can of soft drink, people add large amount of sugar to their body. Getting addictive to soft drinks leads to ineffective insulin production from the pancreas which leads to high blood sugar level in the body. That might lead to pancreatic cancer. 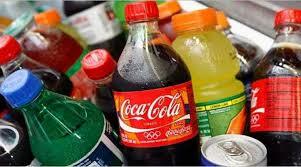 3- Soft drinks increase the risk of tooth decay. The acidic content of soft drinks can dissolve the tooth enamel and make them weaker. Avoid taking soft drinks before sleeping to prevent tooth decay! 4- Soft drinks that contain sodium cause bloating and water retention: Water retention blocks your weight, so in order to get rid of that extra water, you need to drink a lot of water, so DO NOT substitute water for that! 5- Soft drinks are high in caffeine content: Caffeine increases heart beats, causes irritability, tension, and other side effects. Soft drinks also increase blood pressure, due to their content of sodium bicarbonate and sodium benzoate. Caffeine is addictive, that what makes people addictive to soft drinks! 6- Soft drinks can also lead to osteoporosis (bone loss). This is because the phosphoric acid in the soda causes calcium in your bloodstream to be excreted through urine. Your bones will consequently lack calcium which leads to osteoporosis. Although diet soft drinks do not contain calories, they do increase appetite and enlarge our stomach and so lead to a gain in weight! The sweetener used in soft drinks is Aspartame. It is 200 times sweeter than normal sugar, but it is not the cause of cancer development according to the National Cancer Substitute. Soft drinks can cause cancer if too much is consumed per day and that’s due to the colorants especially the caramel colorants! But a human being would have to drink more than 1,000 sodas a day, which is impossible.